You need to have the right personality to enjoy the job of a phone banker. And exactly this will be tested the most in an interview–your personality, and your attitude. People who do not have stomach for this job will quit in a week, or in a month, and they will just suffer in work. 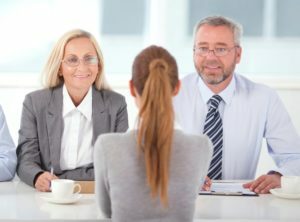 Therefor the HR managers try their best to pick job seekers who enjoy talking on the phone, and who do not mind selling, and who can get over rejection quickly. How do they choose these people? They will inquire about your motivation, sales skills, the working environment you’d prefer, your knowledge of banking products, and your understanding of the job. Phone bankers do not only answer the calls and address the requests of the banking clients. They also try to up-sell the clients, and they collect information from them, trying to get valuable feedback that will eventually help them to make even more sales. Do you have the right personality for this position? Role play is by far the best possible way of assessing your sales skills, and your readiness for the job of a phone banker. The interviewer will play a client of a bank (sometimes an angry client, or a simple one), and you will “play” a banker on the phone. How do you answer the call? What questions do you ask the client? How do you answer their questions? Do you use an opportunity to sell them something? Remember: They do not expect to hear an excellent sales talk from you (you will get a training before starting your job, and you will learn everything you need to know before that). But they still want to see whether you understand the basics of a phone call with a customer, and whether you are not afraid of the task ahead. And that is exactly what you should show in the role play–courage, curiosity, sales skills. Why did you apply for this job? Tell them that you enjoy talking on the phone, that you believe to have the right skills to become a good phone banker, or that you’d love to work in banking sector. Alternatively you can point out your experience in the field–if you have such an experience. What do you think makes you a good candidate for phone banker position? Try to list your skills and abilities. Tell them that you are patient, and do not mind spending a lot of time on the line. You can also say that you have a good understanding of other people and of their needs, and possess decent sales skills. Give an example of you dealing with an irate customer and what you did to fix the problem. Talk about your successful sales experience. If this is your first job application, you can talk about selling your ideas to other people, either in school, or in the family. And if you’ve worked in retail before, narrate any situation when you made an unexpected sale, and made some money for your employer. How do you imagine a typical day in work? Phone, phone, phone. Nice people, but also people who’d hang up (actually many of them), and people who’d be upset about your call. Show the interviewers that you do not wear pink glasses and see this job realistically–with both good and bad things that belong to the daily bread of phone bankers. How do you feel about spending eight hours a day in front of a computer? Tell them that you are used to spend a lot of time in front of a computer screen, that your eyes are used to it, and that you won’t struggle with your concentration in work. Is there a group of people you find it difficult to talk to? You will be assigned to call to a certain segment of bank customers, so you can calmly talk about your preferences. At the same time, however, you should stress that while you prefer some groups of clients, you’re ready to handle any phone call, with any type of a client. Even if you find it difficult, you will do it. How would you introduce yourself to the customer? Keep it simple and professional–your name, position in a bank, and reason why you are calling. You can emphasize that non-verbal communication also matters, and that you will try to answer each call (and make each call) with enthusiasm in your voice. Show the interviewers that you really care, and will do your very best to close some deals for them. This is random customer profile (interviewer shows you a sample profile of a bank customer of a bank, describing their age, occupation, marital status, and banking products they use at the moment). Which product would you offer them if they called you to process a routine transaction on their account? If you apply for a phone banker position at Wells Fargo (or if you struggle with interview answers), you should have a look at an excellent eBook from Jacob Gates, a recruitment consultant from Philadelphia, who worked at Wells Fargo for several years. Jacob changed his career and now helps people to get a job at Wells Fargo, mostly the job of a teller, phone banker, or a personal banker. Check his eBook to see multiple brilliant answers to all common phone banker interview questions, and also to learn how to ace a role play: Link to Jacob’s page. Thank you for reading this article, good luck in your interview!